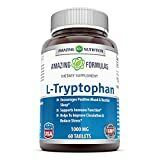 L-tryptophan is an essential amino acid (one that must be obtained through dietary sources as the body cannot manufacture it on its own) which is a precursor for the neurotransmitter serotonin. In the diet, L-tryptophan is present in small amounts in legumes, grains, milk, yogurt, eggs, meat, nuts, beans, fish, and cheese. The conversion of L-tryptophan to serotonin is a two-step process. First, L-Tryptophan is converted into 5-HTP (5-hydroxytryptophan) and 5-HTP is then, in turn, converted into serotonin (also known as 5-HT), one of the neurotransmitter chemicals that carries messages between brain nerve cells. Neurotransmitters are secreted by one cell and picked up by receptor proteins on the surface of another cell. Once the message has been delivered, a neurotransmitter is either destroyed or absorbed into the cell that made it. This process is known as re-uptake. When re-uptake is inhibited, the effect of the neurotransmitter (in this case serotonin) is amplified. Neurotransmitters like serotonin are involved in the regulation of pain, pleasure, anxiety, panic, arousal, and sleep behavior (the sleep-wake cycle). Tryptophan (L-Tryptophan) supplements are availabl in capsules and bulk powder. Helps the Horse and therefore the Human! My horse can be super reactive to his environment, which in turn used to make me hyper-vigilant about what might set him off.